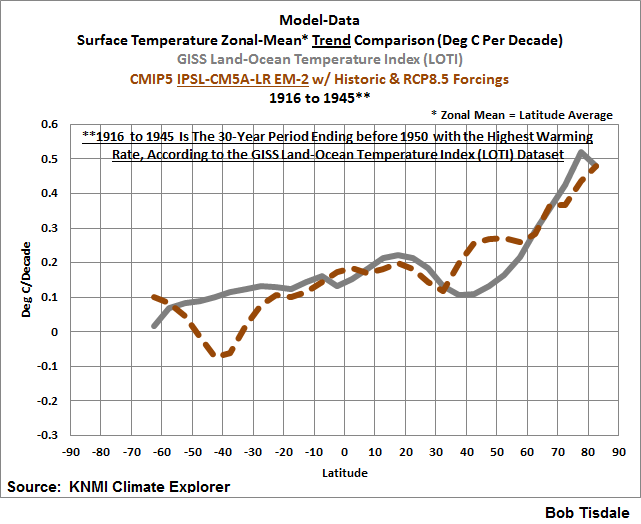 This is part 2 of the post Global Mean Surface Temperature: Early 20th Century Warming Period – Models versus Models & Models versus Data (The WattsUpWithThat cross post is here). 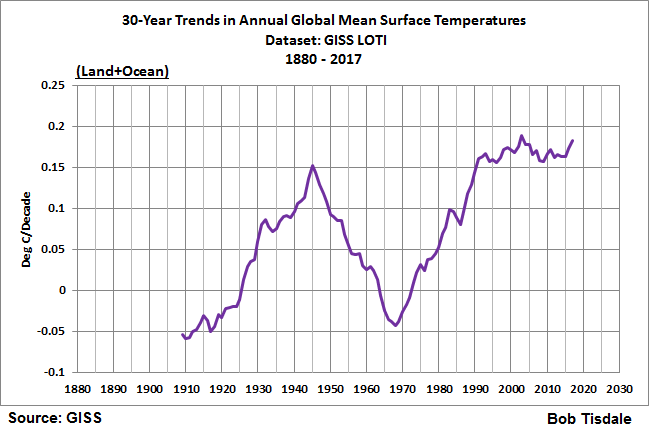 In that post, using the GISS Land-Ocean Temperature Index (GISS LOTI) dataset, we determined the 30-year period that ended before 1950 with the highest warming rate. It was 1916 to 1945. See Figure 1. If a graph of 30-year trends is new to you, see the discussion that follows “A note for newcomers” in the post linked above. In that earlier post, based on the climate model outputs of the ensemble members stored in the CMIP5 archive with historic and RCP8.5 forcings, for the period of 1916-1945, we also identified (1) an ensemble member that ran warmest (GISS-E2-H p3), (2) one that ran cool (IPSL-CM5A-LR EM-1), (3) the ensemble member with the highest trend (IPSL-CM5A-LR EM-2), and (4) the one with the lowest trend (CMCC-CMS), the last of which presented a cooling (yes, cooling) rate of -0.055 deg C/decade during a 30-year period when data indicate global surfaces warmed at a rate of about +0.15 deg C/decade. Polar Amplification refers to a natural phenomenon through which surfaces at high latitudes of the Northern Hemisphere warm [cool] at rates that are noticeably higher than the warming [cooling] trend for the rest of the globe. …presented in this post is the KNMI Climate Explorer. The best way I’ve found to illustrate the effects of polar amplification is by plotting the latitude-averaged surface temperatures trends for the period in question. See Figure 2. 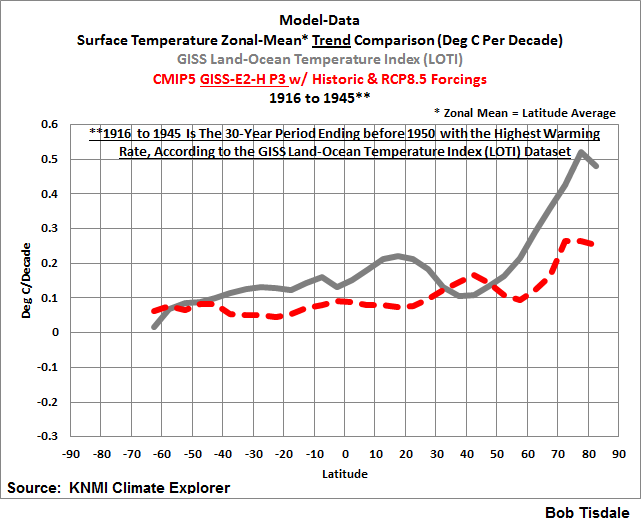 It is a graph that compares the observed global mean surface temperatures trends and those of the multi-model mean of CMIP5 climate models outputs, both on a zonal-mean basis. 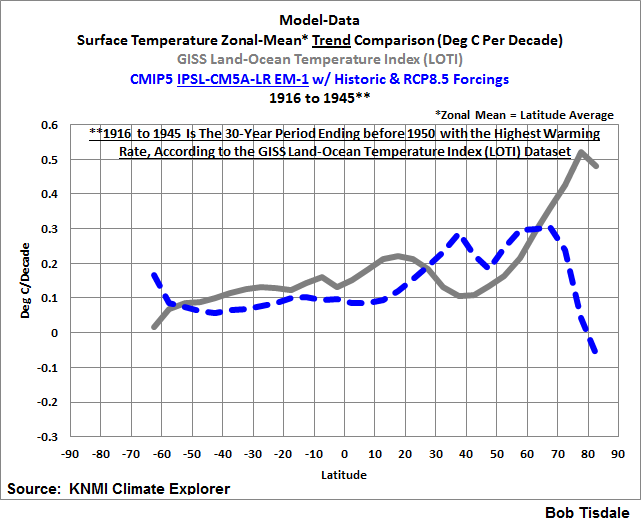 (Instead of latitude average, the climate science industry uses the term zonal mean.) 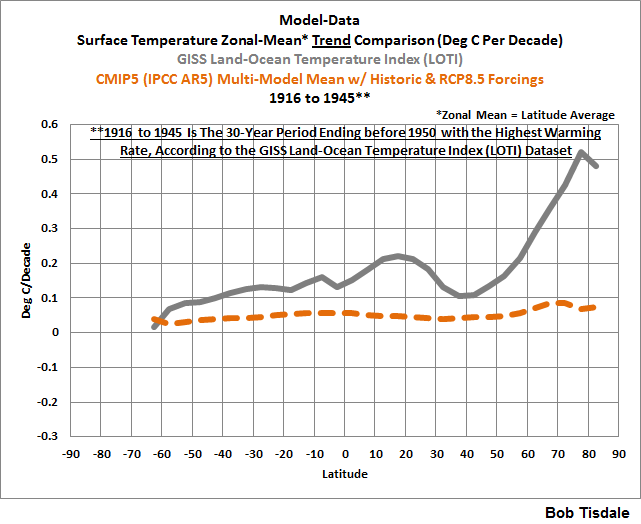 The observations-based data are represented GISS Land-Ocean Temperature Index (GISS LOTI) dataset, and the models are represented by multi-model mean of the climate model simulations of global surface temperatures based on the models stored in the CMIP5 archive with historic and RCP8.5 (worst case) forcings. The curve of the data during the early 20th Century warming period of 1916 to 1945 (solid grey curve) shows a classic example of polar amplification. After the mid-latitudes of the Northern Hemisphere, the warming rates climb higher and higher as the data near the North Pole…but then suddenly stop. On the other hand, the average of the climate model outputs (the multi-model mean, which is presented as the orangey dashed curve) shows little to no polar amplification during this period. I present the model mean because it represents the consensus (groupthink) of the climate modeling groups for how surface temperatures should warm if they were warmed by the numerical representations of the forcings that are used to drive the models. 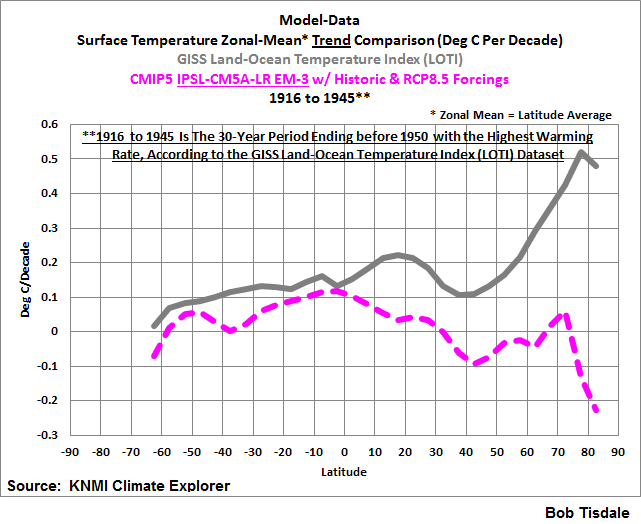 Because the models couldn’t simulate the warming that took place during this period at most latitudes (other than the slight warming at about 60S latitude, where the model and data curves intersect) the warming must have occurred naturally. Figures 3 through 6 present the model-data comparisons using the same observations-based data as Figure 2. They also include the 4 ensemble members we isolated in the post Global Mean Surface Temperature: Early 20th Century Warming Period – Models versus Models & Models versus Data. I’m not going to bother to comment on them individually. You’ll see why. There are 4 ensemble members at the KNMI Climate Explorer for the runs of the IPSL-CM5A-LR model. When asking for the outputs of a model in anomaly form, the KNMI Climate Explorer provides the outputs of all ensemble members in sequence, so they are easily isolated from one another. As a result I had two more ensemble members of the IPSL-CM5A-LR model on file in MS EXCEL. They are identified at the KNMI Climate Explorer as IPSL-CM5A-LR EM-0 and IPSL-CM5A-LR EM-3. 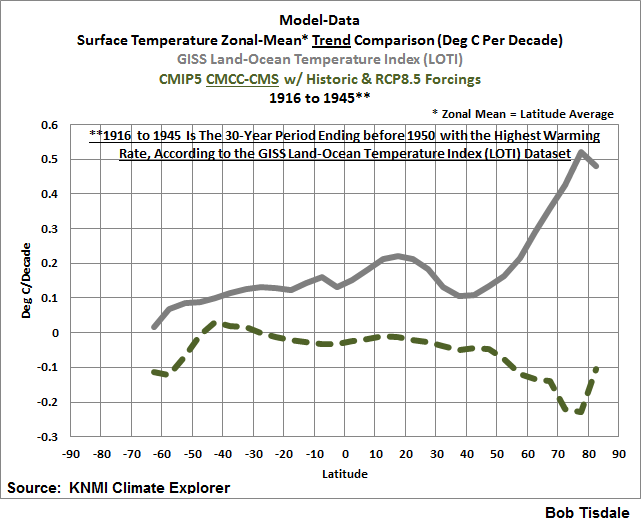 Their simulations of global mean surface temperature trends on a zonal-mean basis for the period of 1916-1945 are presented below in the format of this post as Figures 7 and 8. Figure 9 is a spaghetti graph that shows the curves of all of the ensemble members presented in this post. I’ve included it to counter any erroneous impressions created by the model-mean presented in Figure 3. 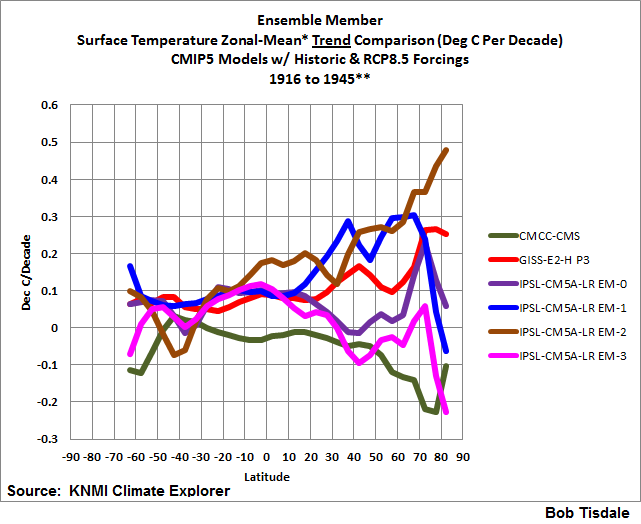 The only thing consistent about the ensemble members of the CMIP5 archive shown in this post is their inconsistency when attempting to simulate global mean surface temperatures and resulting polar amplification during the early 20th Century warming period of 1916 to 1945. 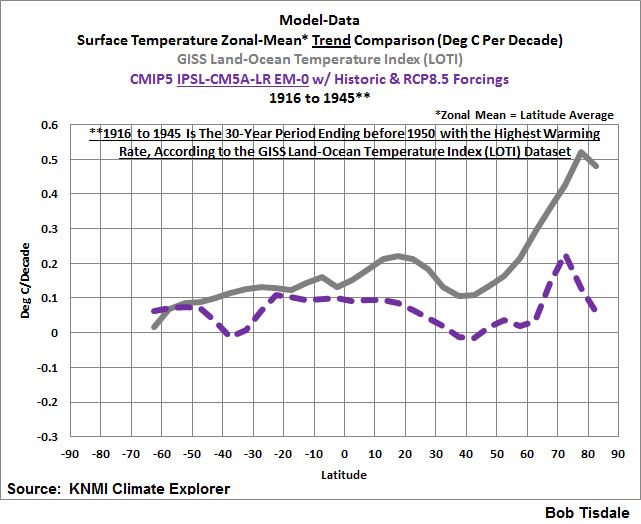 The next two posts in this series will examine climate model outputs and compare them to data during the 30-year mid-20th Century cooling period with the lowest linear trend. In the following, I’ve initially repeated the closing comments from the earlier post in this series. The IPCC couldn’t be a scientific entity. No scientific entity would set its foundation on models that perform as badly as this. The climate models stored in the CMIP5 archive should be presented as examples of failed attempts to simulate Earth’s climate, not used for government policy. Dad, Why Are You A Global Warming Denier? (For an overview, the blog post that introduced it is here.) Also available in paperback. This entry was posted in Model-Data LOST, Polar Amplification. Bookmark the permalink. While I appreciate WUWT, its too bad that more people don’t follow your blog. I have to go to WUWT for comments. I keep trying to get WUWT-ers to visit Climate Observations. The Warmistas malign you, but cannot refute your observation-based postings. There is probably a simple explanation for the polar amplification: the surface area of a circular zone on a sphere decreases with increasing latitude. This drives the ocean currents (Gulf Stream and Japan Current) deeper. The surface to volume ratio changes and there is less surface evaporation to cool the ocean water. Here is a reference that describes the process. Also, there is some useful information on the Woods Hole web site. Note the increase in wind speed/evaporation in the winter months and the polar ‘hot spot’ from the Gulf Stream. Hi Bob, Steve Goddard has a lot of posts showing GISS adjustments that seem to regularly cool the past. 1. Do you agree that they seem to cool the past? 2. If so, does this LOTI data set exhibit the same adjustments. 3. If so, could they have inadvertently caused the early 20th trend to go higher? Thanks so much for an informative post explained simply. dellwilson, I’ve seen Steve Goddard’s comparisons but haven’t looked into it myself recently. Regarding your last question, I can’t answer without examining the older data, which is not on my list of things to do. if you haven’t already. Mathematician/scientists from the London School of Economics and the Mathematical Institute of Oxford discuss the problems associated with optimizing models and ignoring real world data. The caution is that the map is not the territory. This needs to be read and widely distributed. It’s an excellent discussion of the Ludic Fallacy in logic, and vitiates the current efforts to refine and improve models in climate-like problems (though not in weather-like problems).